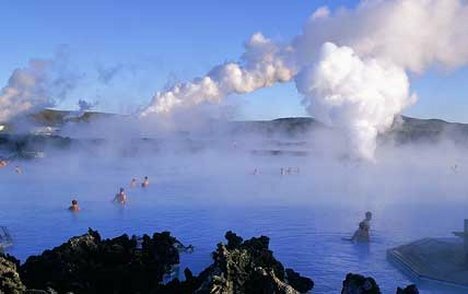 It can be freezing outside in the Reykjavik region of Iceland, but once in the Blue Lagoon, the geothermally-heated seawater keeps you quite warm and safe at 98 to 102 degrees fahrenheit. No dangers lurked here. Even the bacteria common to man cannot life in this water! No chlorine is needed! Amazingly, once you are in the water, the water so thoroughly relaxes you that worries seem to evaporate to nothingness. At the lagoon, a million and a half gallons of geothermal-heated water, consisting of two parts saltwater and one part freshwater, are renewed every forty hours. The water contains minerals, silica and algae, which is proposed to work wonders on skin diseases such as eczema and psoriasis, and a horde of diseases I've never even heard of! What is even more astounding is that the Blue Lagoon is located right between 2 continents. Two tectonic plates, the Eurasian plate and the North American plate, meet nearby the Blue Lagoon, and are closely associated with Iceland's active volcanic systems. 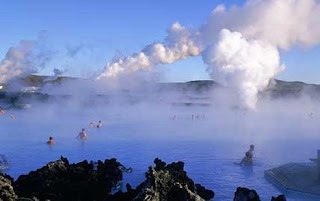 Although stress may be experienced deep in the earth, once in the Blue Lagoon, we don't even remember it. We are perfectly at peace amidst elements that could otherwise take their toll on us. This is what King David is referring to when he wrote Psalms 27:5. We can be at rest amidst the storms of our life if we leave everything we face in God's hands. We don't need to be in control! God is! We each have bad days or weeks. But we have something to look forward to. We can rest in the presence of God, basking in His restoring power. He revives us, He fills us with inner peace, and He reassures us that everything is okay. He is in charge and He will never let us down. And THAT is truly something to look forward to! Anyone can experience God. All we need to do is to come to Him, to be willing to hand Him the reins of our lives. Interestingly, the storms of life will grow strangely dim, but His face will radiate through the haze of circumstance, and our focus will be riveted on what is most important in life: our Forever Friend Himself! Dear Lord, we thank You that we can count on You. Help us remember that when things look the worst You are there. In Jesus’ Name, Amen.